I’ve been waiting for this plane for quite a while—a year or so? I don’t think I’ve been so eager to get my hands on a tool since I decided to jump into woodworking and got my first #5 and old disston. At Handworks I had walked into the barn wondering if I’d see this plane on display, and sure enough, Rob & Terry were there showing it off. The price, $399, made me pretty nervous, but the case and two blade boxes included for preordering took the edge off a bit. 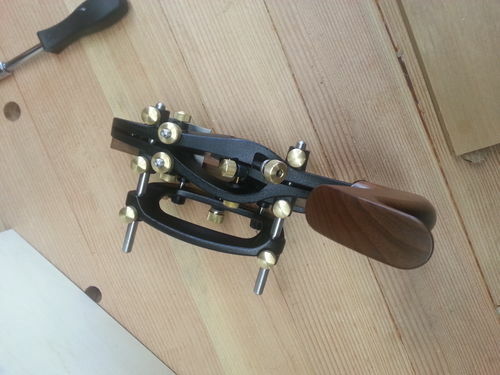 This is my first plow or rebate plane of any sort (closest thing I have is a Veritas Router Plane), thus my excitement, but unfortunately I can’t offer a comparison to older Stanleys or Records. 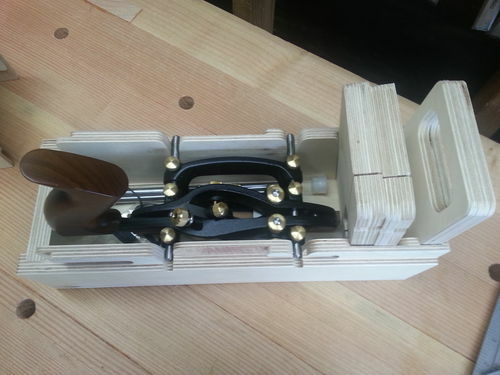 I’ve had some time to try out on some scraps, and as it stands, I’m very happy with the Combination Plane. This will be faster, easier, and more precise than using a handsaw and/or router to do rebates and grooves. On to the details. The pictures up top show the overall kit. 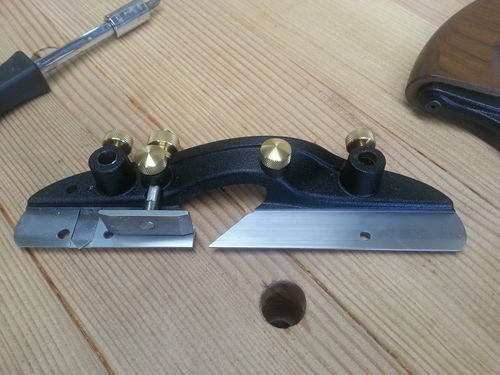 The plane comes with a single 1/4” blade, to which I added a 1/8”, 3/8”, 1/2”, 3/4” and the widest 1 1/16” option. I figure that’ll cover me for now, and I’ll add blades as I desire them for specific projects. Next time I do a batch of picture frames I plan to pick up some of the beading/reeding/fluting bits for adding details. When first holding the plane, it feels substantial, precise, and built to last. Somewhat unexpected bonuses to me were an extra set of longer fence rods (shown in the plastic tube in the third picture up top) and the wooden fence piece. 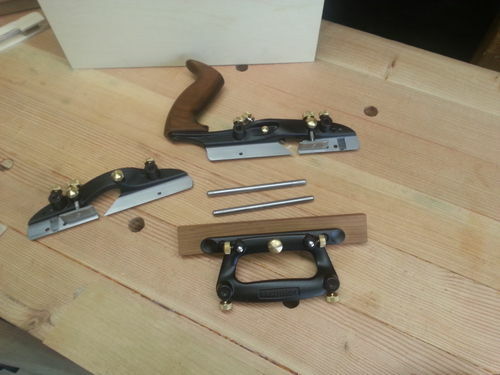 Other than the blade selection, the base plane is a complete kit, no compromises or shortcomings. The knobs are confusing at first, but after a few minutes of fiddling, are second nature. On the fence there are two locking knobs for fixing the whole fence assembly onto the rods. Lower on the fence are two more locking knobs paired with a fine tune knob that has an addition roughly 1”? of travel. Similarly both depth stops have a locking knob and another knob for depth adjustment. There’s a little play in the depth knob that seems out of character with the precision on the rest of the plane, but still works well. Two spears each have a pair of allen screws; one to lock the depth and the other to fine tune the side-to-side ‘splay’ of the blades. The handle feels a bit tall for me, I found myself shifting my hand lower to get behind the plane rather than on top of it. See the first picture up top, there’s space between the horn and the top of my hand. I’m chalking it up to being a newbie, but at first the plane felt a bit wobbly and hard to find vertical, even with the fence. After some practice this became easier, though. At handworks I was surprised to learn they also had a box/case for the plane and blades. I had planned to make my own, but this one is plenty nice. The case and the blade boxes are made of fairly nice plywood (I am not a plywood expert). 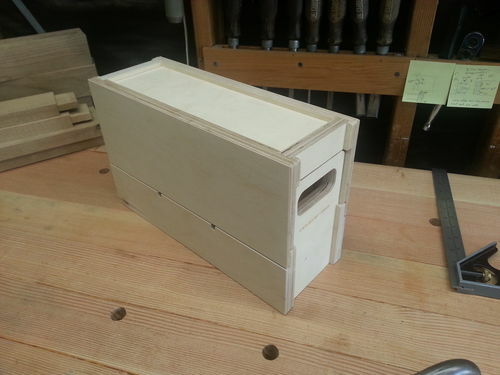 The blade boxes include rubber bands to hold the lid on, and have a dedicated slot in the case. Here I ran into a bit of trouble. With the rubber bands, fitting the blade boxes into the case is a little finnicky. Also getting the case cover on/off over the blade boxes was a bit tricky; it’s a tight fix. I just omitted the rubber bands (the case will keep the blade box lids on), and everything fits together much more easily. Alright, that’s about all I’ve got to say. I’ll try to comment back when I’ve used the plane more on a real project—the end table I’m currently building will have a drawer in it and involves some rebates and grooves. The “plane” a tool, that always confounded me; and yet the only thing that it improved was my vocabulary. But I do recognize a quality tool when I see one; your review is 5 star, to me. I like video’s; attached is a video, that I feel adds to your words and pictures. Best to you and other plane Meister’s. I have only a vague idea about what this tool can do, but I appreciate a good overview review, so thank you. I learned from it, and I am happy you are excited about this new device. A question or two, please: – Is this so rarely made that it takes a year to get one – thus you had to wait? - Who are Rob & Terry? 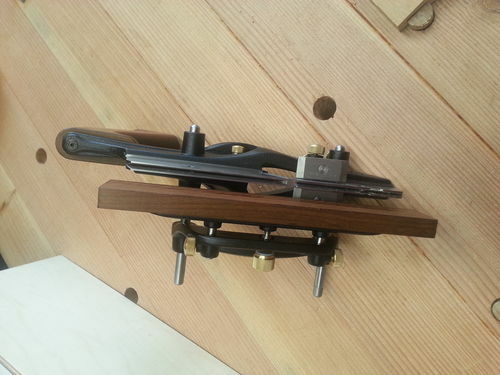 The combination plane is a new product, and it was available for preorder at the handworks tool show last may. Before that there were rumors of this plane circulating. Once it’s generally available (any day now), there should be no wait time. Other than being new, it’s not a rare plane. I was referring to Rob Lee, who is the Lee in Lee valley, and Terry Saunders, one of the more visible Lee valley/veritas employees. I’ve got their small plow. Do you know how much larger this one is? It looks larger but not as large as I imagined. 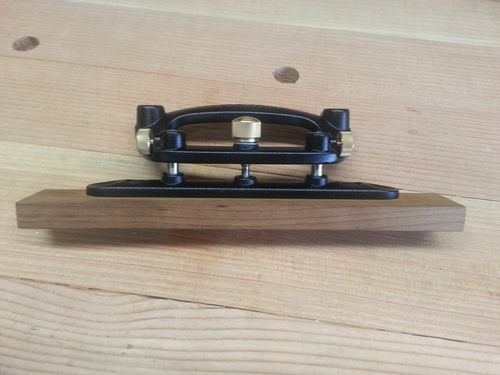 I almost preordered one at handworks, but then reality steered me away since I already have a 45 and 55. Glad to see a review on here, that is a beast of a plane. I see on the LV web site that most of the optional blades fit both the plow plan and combo plane. So what is the difference between the two planes? Thanks for the explanation, galooticus. He describes the differences better than I could. 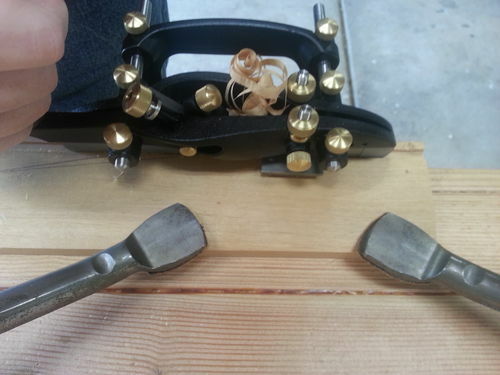 Mosquito and I spent yesterday morning comparing his Stanley 45s to my new Veritas combination plane. He’s going to be writing up his thoughts soon. My take is that the Veritas was the right buy for me, since I don’t have the spare time to refurb a 45 now. DW833, the combination plane takes wider irons than the small plow plane, and can also be switched from left-hand to right-hand operation. I’m still waiting for a real review of this tool; not just a “look what I got”. I know a couple of people that have the combo plane and have had various problems with it. One of them is waiting over a month for a replacement part. From what I have read, combination planes are complex and require practiced technique to master. 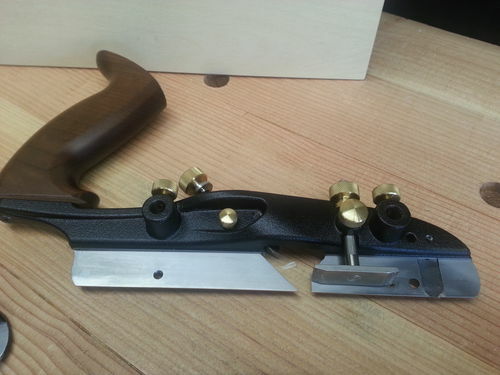 You have to be very careful with wood selection if you are using any of the profile cutters. Consider that to acquire a decent set of cutters, plus the plane, is going to be somewhere north of $600-700, or more. Their plow plane is a really reliable tool for the operations that you are most likely to need this type of plane for. That’s why I’m waiting for a comprehensive review. This is an interesting review and I’ll want to take a look at one when I’m in a retail establishment that sells these. The only place in Atlanta would be either Highland Woodworking or Woodcraft. Thanks for the review. Woodbuster, take a look at Mosquito’s comparison to the Stanley 45. That might answer some of your questions. 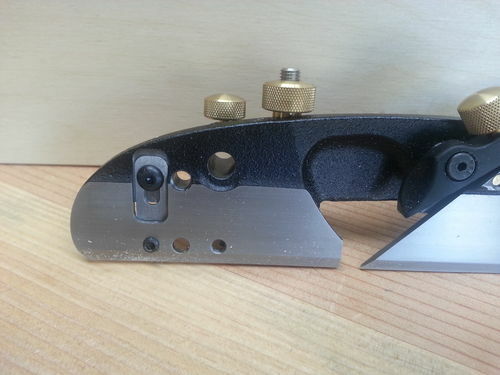 I’m finding the Veritas Comination Plane to be useful, but I didn’t have a plow plane or a 45 already. The Veritas is nice for me in that it came ready to go, and everything is in good shape, so it’s easy to learn how to use it. With a vintage 45, I would have been wondering if problems were in my setup or if something was missing from the plane. To be fair, I’m mostly using it as a plow plane so far. But I’ve been experimenting with other uses and I’ll be using more of its capabilities over time.